So you’ve made it all the way this far. 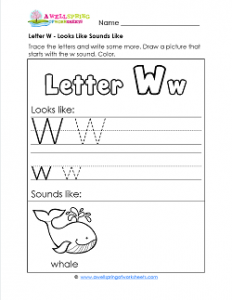 The cute little whale on this letter w looks like sounds like worksheet was waiting for you to come his way! Here kids trace the uppercase W and write at least three more. Then they do the same with the lower case w. The fun part comes when they get to draw a picture of something else that starts with w. Of course, you’ll help them come up with ideas. 🙂 Don’t forget to color! Go to this page to see all the alphabet letter looks like sounds like worksheets in this set.